The existence of normal hematopoietic stem cells in the peripheral blood of mammals has been known for a quarter of a century ; however, they were first used to reconstitute the bone marrow of patients after myeloablative chemoradiotherapy only 4–5 years ago [2–6]. After obtaining proof that circulating progenitors are capable of complete and long-lasting hematopoietic reconstitution, clinicians have increasingly employed them as an alternative to bone marrow-derived stem cells. 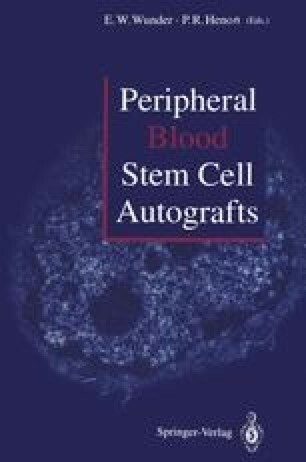 By the end of 1989, over 200 autotransplants of peripheral blood stem cells had been reported or published.